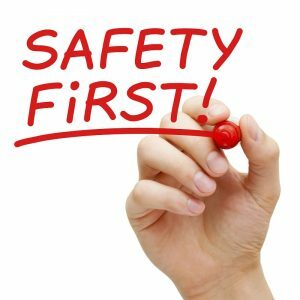 Make a New Year’s resolution to put safety first in your bindery. As the new year begins and all of us make resolutions to exercise more, eat healthier, and finally kick a bad habit, it’s also time for all of us to make professional resolutions! A great resolution with a high impact is creating a safer bindery department. Over time, everyone naturally gets a little less strict and a little less organized, so here are some easy tips for getting your bindery in better shape. It seems overly simplistic, but a checklist can remind you of all the steps you lose sight of over time—every single day. At one hospital, with well-trained healthcare professionals, they studied how frequently doctors completed basic required steps of care. Over one third of the time, skilled and knowledgeable doctors skipped at least one step. The same department implemented checklists as part of their care procedures and the infection rate dropped dramatically from 11% to 0%. This same principle can be applied to your bindery. Implement a checklist now so that every time you handle equipment, you will make sure you are doing so in the safest manner possible. Why Will a Checklist Work? Checklists improve the quality of your final product by forcing workers to acknowledge every step as they do it. Once your checklist is in use, you will discover ways to improve it and make the process faster, leading to increased efficiency and productivity. Checklists improve the way that workers communicate with each other and provide accountability when a project isn’t properly completed. When it comes to making a safer bindery, your checklist will emphasize all of the safety features that we take for granted or sometimes ignore. Checklists can prevent serious and deadly errors from ever happening. This entry was posted on Friday, January 13th, 2017	at 11:36 am	and is filed under Printing tips	. You can follow any responses to this entry through the RSS 2.0	feed. Both comments and pings are currently closed.